For the last couple of years I have made a list of goals that I wanted to accomplish throughout the year which has helped motivate me to get things done. 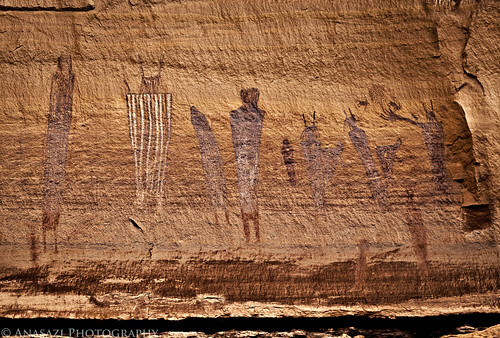 Near the top of my list for 2011 was to finally get to The Maze District of Canyonlands National Park so that I could visit The Harvest Scene pictographs. I was able to secure a campsite permit in April and spent four days and three nights in the Land of Standing Rocks with a couple good friends. Our first full day was spent hiking to The Harvest Scene and it was an incredible experience. This panel is pretty faded and very hard to see in direct sunlight, but fortunately while we were there a few clouds blocked the sun for us and I was able to admire and photograph this impressive panel. The photo above shows only part of the panel, but it’s the part where the name ‘Harvest Scene’ derives. I find the larger anthropomorphic figure on the left with white stripes to be very unique, but my favorite figure is the large one on the right with the outstretched arm. If you look closely at the middle finger on it’s hand, it appears there is ricegrass growing from the tip. On either side of the ricegrass this are small zoomorphs; the left one appears to be a bird and the right one a rabbit. I really enjoyed visiting this site and am planning on hopefully returning again sometime next year and hiking to it from The Maze Overlook. You can click on this photo and view a larger size on Flickr if you want to see the finer details better.